Glorious in their athleticism and their suppleness, the dancers of Ballet Zurich  are a force of nature under the artistic direction of Christian Spuck. 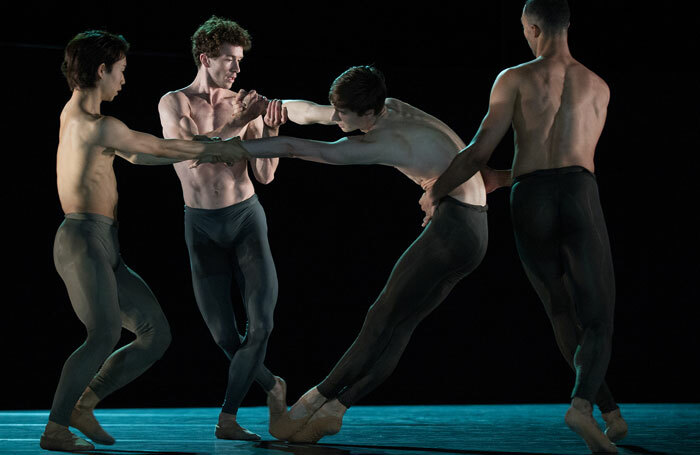 Most obviously so as they bring the elements onto the stage in Wayne McGregor’s Kairos,  which is set to composer Max Richter’s reimagining of Vivaldi The Four Seasons. From the intense opening of Spring, flickering in and out of illuminated areas of the stage defined by strobing light, through tactile duets and strutting summer stand-offs, to the elegiac movements of the various winter sequences, the dancers are mesmerising. Here are the great rituals of life and death portrayed by the interactions of two sets of five male and female dancers, emerging onto a stage lit with ferocity by Lucy Carter. Kairos would be enough on its own to brand this as ‘event ballet’. But, partnered with Spuck’s Sonett  for the Edinburgh International Festival, the programme takes a greater coherence as it begins to examine the relationship between the art forms of music, theatre, poetry and dance. In Sonett, the dancers move away from being the focus. They become an environment for Mireille Mosse, as the Poet’s Shadow, to speak four of Shakespeare’s sonnets (numbers 20, 66, 144 and 147), while Eva Dewaele is the embodiment to Shakespeare’s Dark Lady, prowling the stage in a black dress of improbable size, created by Emma Ryott. The sonnets, spoken in French, have an otherworldly feel to them and a new rhythmic beauty, over and above any meaning you might read into the lines themselves. It is a thoroughly compelling programme, of the kind which submerges its audience in a new world.